Remodel Home Building: How Should I Update My Family Room? Updating a family room can be a lot of fun. There are plenty of options and features you can add to make it the most comfortable room in your house. From recessed lighting to blazing fireplaces, the possibilities are limited only by your imagination. The heart of the home should have a hearth where everyone can gather. 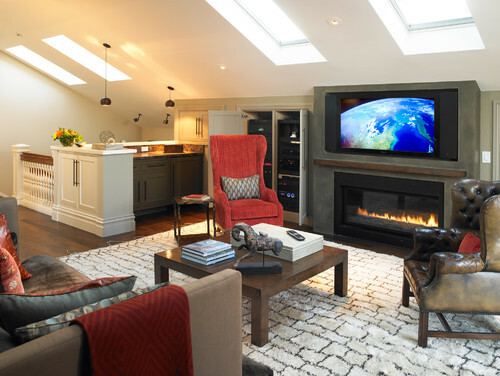 By placing a fireplace within the room, you will create a cozy environment that will always be warm and inviting. Coupled with cabinetry to conceal books, games, and toys, you can create a multi-purpose room that is clean and uncluttered. It’s also a good idea to ensure the room has plenty of light. French doors, bay windows, and skylights open the room up and allow plenty of fresh air to circulate throughout the space. Coupled with exposed beams and vaulted ceilings, and your updated family room will quickly become the only room your family wants to spend time within. The team at Forner – La Voy Builders, Inc. can help you with updating a family room that fits your family’s needs and lifestyle. We invite you to contact us to discover more about our craftsmen and the services we have to offer you.